This week I have mainly worked on the game design document, but I also created this first draft of the map layout. 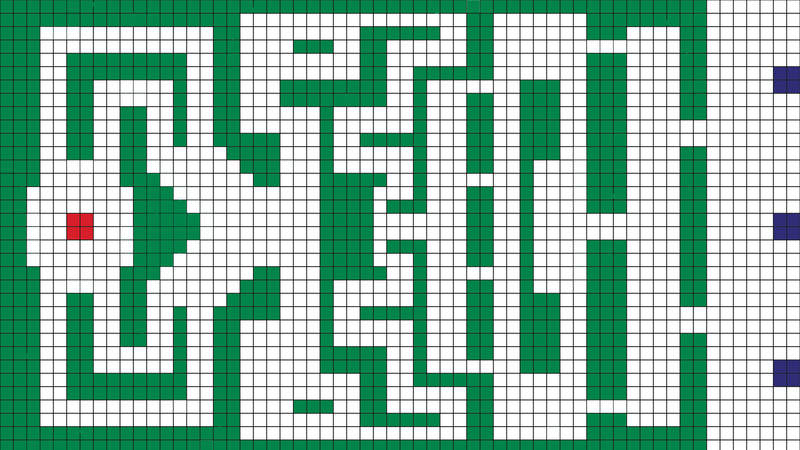 In this layout there are four types of squares, the white squares being the space that the player and NPCs can navigate, the blue squares being the spawn points of the enemy NPCs, green squares being impassable and the red square being the location of the life tree that the player has to protect. At the moment of writing, we have reached the end of the second week of Introduction to Game Development. During these weeks, me and my team have chosen a game to develop, writen a scrum plan and started working on the design document. The Blog is Up, This is Me! This will be my game developer blog, created for me sharing and talking about my work! It was created to be a part of my education at Campus Gotland, as a Game Designer with Graphics courses, and you will be able to see my first work related post soon enough. September 17, 2014 / Comments Off on The Blog is Up, This is Me!